With a combination of styling, features, performance and value unlike almost anything else in the market, the Chevy HHR continues to win over more and more enthusiasts. In 2006, more than 101,000 HHRs were sold � an increase of nearly 200 percent over its �05 debut. In �07, more powerful Ecotec engines, several unique, limited-edition models and the introduction of the HHR Panel production model diversified the lineup, giving customers a broad range of choices. The HHR features an open interior that provides the spaciousness and cargo capacity of an SUV. It has easy-to-maneuver dimensions and room for just about any lifestyle interest. The rear seats fold flat, providing 57.7 cubic feet (1,634 L) of convenient storage. With the rear seats up, the straight roofline and rear liftgate maximize cargo capacity, offering 25.2 cubic feet (638 L). Reconfigurable and convenient storage compartments accommodate everything from groceries to surfboards. This popular small utility and its range of configurations greets the 2008 model year with critical acclaim and federal recognition for its safety features. Since its launch, HHR has received five-star crash ratings � the highest rating awarded by the National Highway Traffic Safety Administration�s (NHTSA) New Car Assessment Program. The five-star ratings were awarded for the driver and right-front passenger in a frontal crash, as well as five-star side-impact crash ratings for front seat and rear seat passengers. 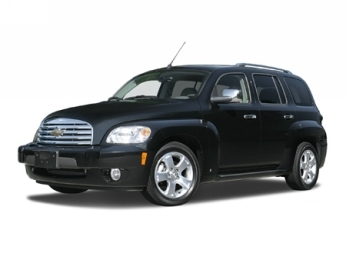 The HHR also was the highest-rated SUV for the 2006 model year in NHTSA rollover testing. New features and revisions for �08 add to HHR�s safety story, including StabiliTrak electronic stability control system, tire pressure monitoring system and OnStar now standard on all models. Other changes enhance HHR�s value and style, including new 16-inch wheels. Also, a new, solid rear quarter panel option enables the customized look of the unique HHR Panel, but with a full, five-passenger interior environment. There are four new exterior colors available in 2008: Cardinal Red Metallic, Techno Gray Metallic, Victory Red and Blue Flash Metallic. HHR is a four-door vehicle with a rear touchpad liftgate. Its high roof evokes the look of the innovative 1949 Chevy Suburban, while other exterior cues carry unmistakably Chevy elements, such as the bold bowtie grille badge and round taillamps, which are reminiscent of earlier Corvettes. The HHR features deep-draw, flared fenders that tuck in at the rockers for a solid, firmly planted stance. A one-piece stamped metal hood is reminiscent of the �49 Suburban�s heritage and is proof of precise assembly quality. More quality touches are found in the single-cavity headlamp design, which incorporates jeweled lighting effects, and in the flared, twin round-taillamp design. Stamped door and window appearances with a one-piece wraparound molding contribute to the clean, detailed design. The HHR�s rear window is flush with the body side. Like the rest of the vehicle, the HHR�s interior combines the reassuring high visibility and cargo flexibility of an SUV with the comfort, appointments, driving ease and ergonomics of an upscale sedan. The vehicle�s high roofline provides increased headroom and creates an open, airy environment. The HHR�s interior evokes a feeling of roominess. Detailed, jewel-like instrument displays and chrome accents contribute to the interior style. Interior color combinations feature darker colors on upper sections of the interior and lighter colors for lower sections. Quality also is conveyed in the tailored seats, which provide firmer support, sculpture and plenty of comfort for long drives. The 60/40-split folding rear seat offers generous and comfortable seating for three, along with comfortable legroom. HHR also has standard air conditioning, providing comfortable levels of airflow, cooling capability and reduced cool-down time. The system is designed to provide efficient side-window defogging and enhanced rear-window defogging. Auxiliary glove box with flip-up cover is located at the top center of the instrument panel for convenient storage of MP3s, cell phones, sunglasses and other smaller items. The front passenger seat folds fully flat, extending the total load length from the liftgate to the instrument panel � allowing 8-foot items, such as a ladder � to be carried with the liftgate closed. The front center armrest is integrated into the seat back frame, so it is out of the way when pivoted into a stowed position; a characteristic of trucks and SUVs. The rear seats feature a 60/40-split design and fold to form a continuous flat load surface in conjunction with the folded front passenger seat. The 60-percent folding side was thoughtfully positioned on the passenger side, enabling wider objects to be positioned diagonally and carried more securely in the vehicle. It provides a continuous flat load floor when the rear seats are folded down. The primary load floor can become a shelf when raised and mounted. approximately 1 foot higher � the shelf can be mounted level or at a 45-degree angle to provide quick access to the cargo beneath it when the liftgate is opened. A 5-inch-deep recessed bin below the load floor can conceal 2.8 cubic feet (79.6 L); the spare tire is located beneath the bin. Two storage bins (0.5 cubic foot / 12.9 L total) are found forward of the load floor, nestled behind the rear seat, and plastic bag holders are conveniently located under the cargo shelf. It comes with a carpeted cargo mat. The rear liftgate is activated via touchpad for ease of opening. HHR comes well equipped from the factory in two models: LS and LT. The LT also comes in two packages � 1LT and 2LT. All HHR models include standard features such as air conditioning, power windows, power door locks, power outside mirrors, cruise control and remote keyless entry. All HHR sound systems, including the standard six-speaker AM/FM/CD stereo, feature an auxiliary channel and front-mounted auxiliary input jack, so that an iPod or other audio source can be played through the vehicle audio system. A powerful, seven-speaker, Pioneer 260-watt amplified premium audio system with subwoofer is standard on the 2LT model and available with other trims. The 1LT model also includes a standard MP3 player, eight-way power seat including power lumbar, and new 16-inch fascia-spoke wheels painted Sterling Silver. Bright chrome exterior trim and a bright exhaust tip are available. ABS is available and traction control is included when the vehicle is equipped with ABS and automatic transmission. New, 16-inch chrome wheels are available. HHR 2LT comes with the larger 2.4L Ecotec engine and FE3 sport suspension with StabiliTrak. Additional standard features include ABS, fog lamps, bright exhaust tip, leather-wrapped steering wheel and shifter, the 260-watt Pioneer sound system with subwoofer and bright chrome exterior trim. Heated leather seats (with two heating levels) are available on both LT packages. Seventeen-inch high-polished forged aluminum wheels are available. Other details shared among HHR models include a sporty three-spoke steering wheel and chrome accents on the instrument panel. The HHR Panel, designed for myriad commercial and private uses, adds a unique dimension of functionality to the lineup. The HHR Panel features windowless side panels and rear cargo doors in place of conventional rear doors. A flat load floor provides more than 57 cubic feet (1,614 L) of cargo space, along with approximately 5 cubic feet (141 L) of covered, under-floor storage. Like HHR passenger models, the HHR panel is offered in LS and LT trims. The HHR Panel also draws upon inspiration from the original 1949 Chevy Suburban, which was built on a platform that offered panel models. These vehicles became essential tools for urban and small businesses and the HHR Panel forges a new market as a great looking, capable vehicle for business needs or enthusiasts who seek a broad canvas on which to express their automotive creativity. The body of the HHR Panel features steel inserts in place of side windows and cargo doors in place of conventional rear doors. The cargo doors open wide to enable cargo access from both sides of the vehicle, as well as from the rear liftgate. The cargo doors don�t have external handles; they are opened via a dashboard release button or the remote keyless entry fob. The large, continuous area created by the windowless cargo doors and rear panels is ideal for business logos, advertising or personalization. An auxiliary power outlet is standard in the rear of the cargo area, as well as a 40-amp auxiliary power connector to provide service for a variety of specialty equipment needs. This also answers the call of upfitters, who asked for an additional power source to suit their specialty vehicles. Inside, the HHR Panel has seating for two and a large, flat cargo floor. Tie-down points are located strategically on the floor and the available, robust floor mats enable easier movement of cargo. Two large, lockable storage compartments, with a lockable option, are located under the cargo floor � in the approximate place of the rear seats of passenger models. The compartments are secure and large enough to hold small computer equipment, flashlights, service manuals and other valuable equipment that is more secure when hidden. The HHR lineup relies on the renowned Ecotec family of technologically sophisticated inline four-cylinder engines, which balances usable power with fuel and emissions efficiency. The standard engine for LS and 1LT models is the Ecotec 2.2L Ecotec engine. The Ecotec 2.4L four-cylinder is available on the 1LT and standard on the 2LT. To comply with more stringent emission and diagnostic regulations, the HHR�s 2.2L and 2.4L engines receive a new catalytic converter system with slightly elevated exhaust system backpressure. The 2.4L engine is rated at 172 horsepower (128 kW) and 167 lb.-ft. of torque (226 Nm); at the time of publication, the 2.2L was still undergoing certification to SAE standards. The information will be updated as soon as it is available. HHR�s Ecotec engines also benefit from features designed to reduce noise and vibration. The pistons, for example, have a polymer coating and skirt design that reduces noise during cold starts, while a new, two-layer acoustic engine cover is tuned to reduce noise. NVH is also reduced with a new automatic tensioner that maintains optimal tension on the timing chain. Transmissions include a standard F23 five-speed manual transmission or an available Hydra-Matic 4T45 electronically controlled four-speed automatic, which are available with both engines. The F23 five-speed manual transmission delivers smoothness and durability, with all gears � including reverse � featuring synchronization. The available 4T45 is a smooth-shifting, highly durable automatic transmission. Like the F23 manual transmission, there are calibration differences to optimize the performance of 2.2L-equipped models and 2.4L-equippped models. All models, regardless of engine or transmission, are designed for flat towing. HHR is built on a robust, global small-car architecture. This lower-dominant structure is designed with strength in the lower portions of the chassis, contributing to an overall feeling of rigidity, effectively minimizing noise and vibration. The use of premium materials, such as Quiet Steel laminated panels in the plenum area, further enhances the vehicle�s overall quietness. Extensive use of high-strength steel and ultra-high-strength steel in key structural components, including the rocker panels and cross-vehicle reinforcing beam, bolsters the vehicle�s rigid feel while providing additional side-impact support. The cockpit �safety cage� provides load-carrying protection and, along with laser-welded blanks used in the doorframes, front doors and rear doors, contributes to the HHR�s NVH characteristics and build quality. A MacPherson strut front suspension design is used, along with a semi-independent, torsion beam rear suspension and five-lug wheels. Two suspension systems are available: FE1 suspension standard on LS and 1LT, with an FE3 suspension standard on the 2LT model. The FE1 suspension is tuned for a softer ride and includes 16-inch wheels, while the FE3 provides sportier handling traits and offers standard 17-inch wheels and monotube shocks, which enhance ride and handling. Forged aluminum high-polished 17-inch wheels are available. All models are equipped with rack-and-pinion steering with electric power steering (EPS) � a speed-sensitive, variable-effort system with specific tuning calibrations to match the performance characteristics of each of the suspension settings. EPS eliminates the use of an engine-driven power steering pump, as well as the corresponding fluid reservoir and plumbing, reducing both fuel consumption and the potential source of an environmental contaminant. Brakes consist of large front discs and rear drums, with ABS and traction control standard on 2LT models (traction control available only with automatic transmission) and available on LS and 1LT models. New for 2008 is the availability of StabiliTrak, GM�s advanced electronic stability control system. It assists the vehicle in maintaining the driver�s intended path by applying a brake force at any corner of the vehicle independent of the driver�s use of the brake pedal. StabiliTrak is integrated with the traction control and ABS brake systems. HHR is designed to protect occupants in the event of a crash � a design that helped garner a five-star crash safety rating for both frontal crashes (driver and right-front passenger) and side crashes (front- and outboard rear-seat passengers, when equipped with side air bags) from the National Highway Traffic Safety Administration�s New Car Assessment Program tests. Standard safety features include dual-stage frontal air bags with GM�s Passenger Sensing System. This system works with the front passenger seat and differentiates between adults � 5 th percentile females and larger � and small children or child seats to adjust air bag deployment. Additionally, HHR has front safety belt pretensioners, rear-seat center lap-shoulder safety belts and the LATCH child seat retention system. Head curtain side-impact air bags for front- and rear-seat outboard occupants are available. OnStar is standard on all models and features enhanced hands-free voice recognition capabilities, including more intuitive continuous digit dialing and improved voice recognition accuracy (with digital service). OnStar is the leading provider of in-vehicle safety, security and information services in the United States and Canada . Using the GPS satellite network and wireless technology, OnStar features core safety services and OnStar Hands-Free Calling that allows drivers to make and receive voice-activated phone calls using an externally mounted antenna for greater reception. The OnStar service standard on the 2008 HHR includes the General Motors Advanced Automatic Crash Notification (AACN) system, making crash data available to the participating 911 centers to help them dispatch the appropriate live-saving personnel and equipment to crash scenes faster.